Parent graduates listen on Friday, April 13, to one of the valedictorians on the program talk about their experience in the PASOS program. WESLACO — Joshua Donis joyfully photographed his mother, Christina Donis, walking the stage in her cap and gown. 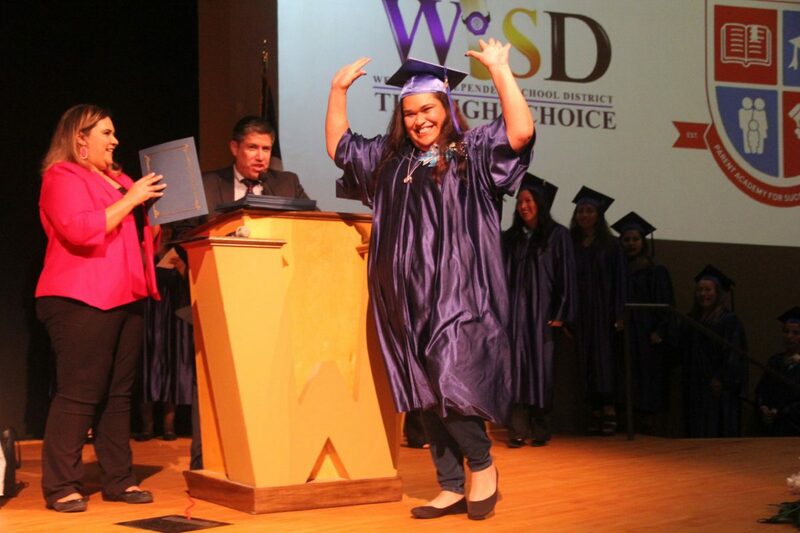 Christina and 42 other parents from the Weslaco school district were graduating from the Parent Academy for Success of Schools, receiving their graduation certificate from the superintendent during a Friday, April 13 ceremony. Joshua, an eighth-grader at Garza Middle School, expects to become a doctor and the first college graduate in the family. Parents walk into the auditorium Friday, April 13, for graduation as their children take their photo of them in their cap and gown. Many of the parents are together Friday, April 13, for one last group photo after graduation. 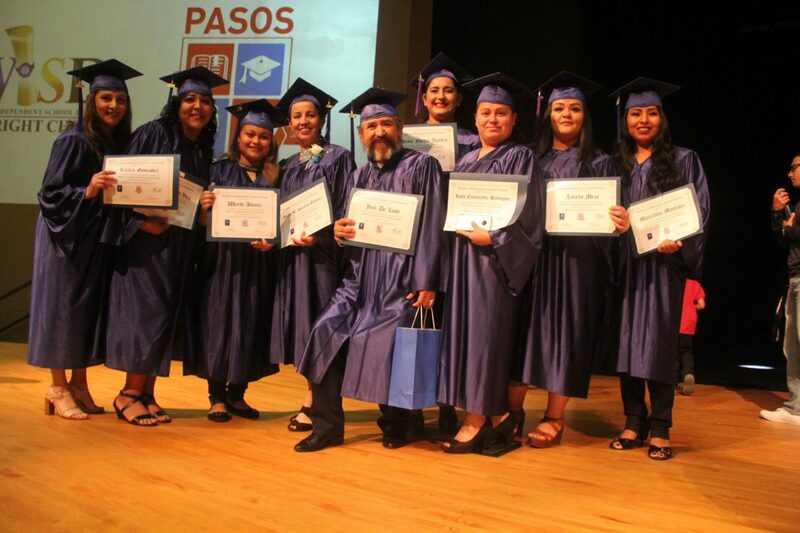 Parents at the PASOS graduation toss their caps in the air Friday, April 13, for completing the 10- week program. PASOS graduate Carol Davila walking the stage on Friday, April 13, to receive her certificate from the superintendent for graduating the parent training program. “Through this program, she has learned how to ensure my future through college, and I’m really proud of her,” Joshua said. The parents worked very hard and put in the time and effort to ensure that their children are succeeding. 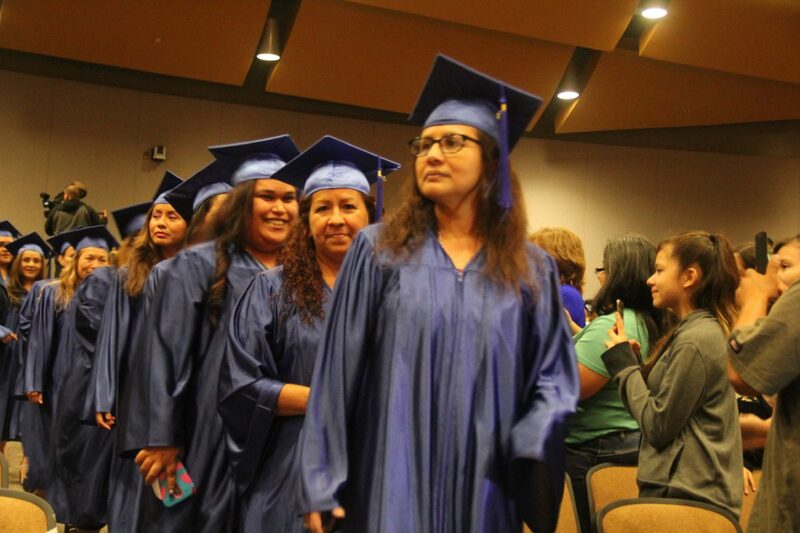 The graduation is a culmination of all the hard work, dedication and parent participation in PASOS training sessions that help parents guide their children through the educational process. She told the graduates to keep on learning, and if we can do anything to better serve the students, let us know. 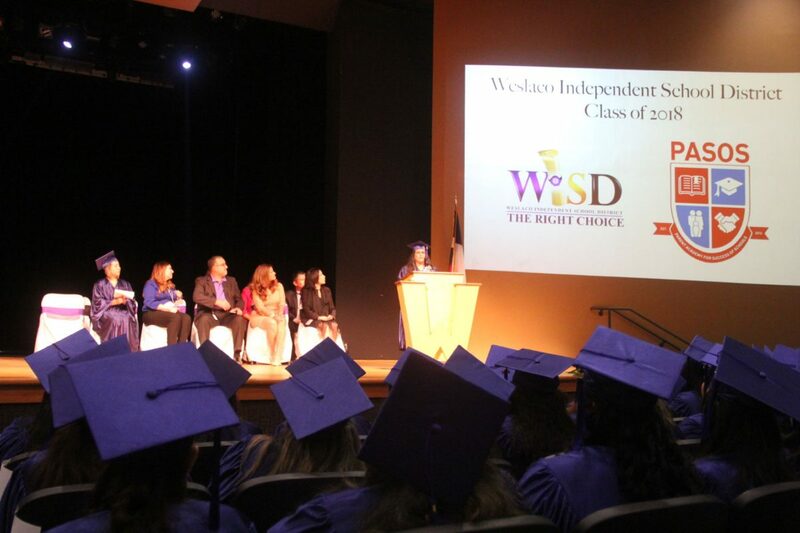 This year’s ceremony marks Weslaco ISD’s second PASOS graduating class aimed at helping the district’s students achieve educational success by making available parental engagement training. District Judge Renee Rodriguez-Betancourt was the guest speaker for the graduation and spoke about her success that stemmed from her stable, hard-working parents. “My parents didn’t have college diplomas on the wall; they are migrant farm workers to this day,” Rodriguez-Betancourt said. She told the group of graduates her parents’ ultimatum: choose to be educated or choose to work with them. She also said her parents’ primary rule was to treat everyone with respect and always work hard. “If my parents could raise children like us, you can raise children like us and even better,” Rodriguez-Betancourt said. For 10 weeks, the 43 Weslaco ISD parents met on Thursday mornings to learn strategies to help educate, motivate and prepare their children for success in school. The district partnered with the Texas Valley Communities Foundation, a Mercedes nonprofit focused on empowering the Valley with its PASOS Parent Academy, a program the nonprofit offers using a number of proven academic success tools. Another parent who graduated from the PASOS program last week at Weslaco said she plans to go back to college and earn her degree on her way toward becoming a registered nurse. 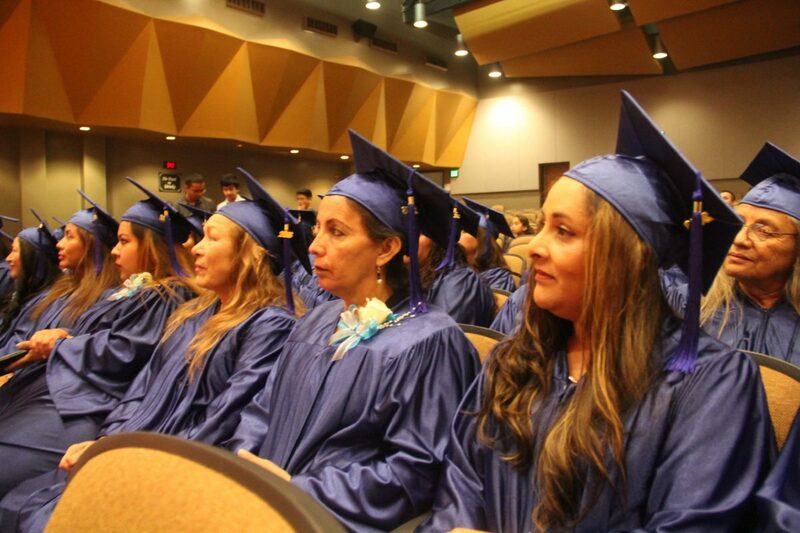 Leticia Elizondo, 49, an LVN at Nuestra Clinica, completed the program realizing it’s never too late to graduate. “The program really helped me a lot,” Elizondo said. 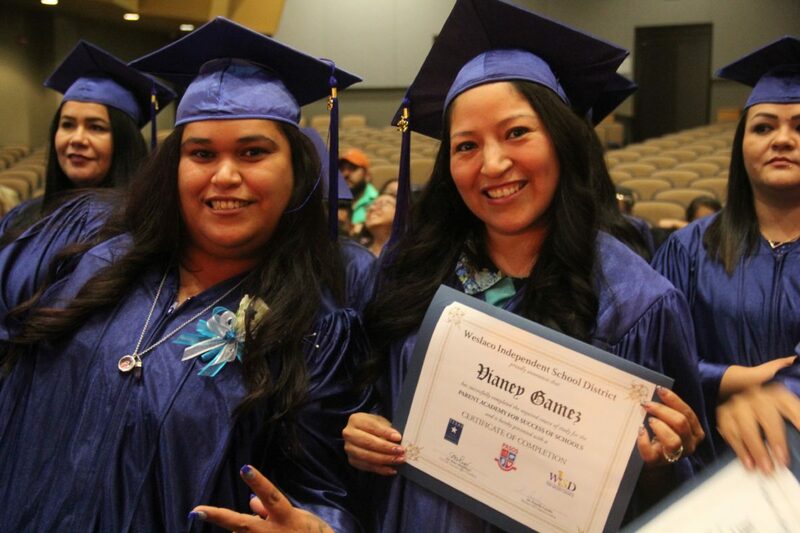 Even though Leticia has participated in ceremonies when she graduated high school and when she received her LVN certificate, she said the PASOS graduation was even more special because her children were in the audience watching her complete the parent training. “We have had many parents share stories regarding how PASOS has impacted them,” said Erica Garcia, WISD parental involvement director. She said there is a difference in the parents, and now they are confident to go into classrooms to speak to teachers and administrators. She said the parents looked forward to their morning classes. Francisca Salas has been volunteering at the publics schools for 24 years. 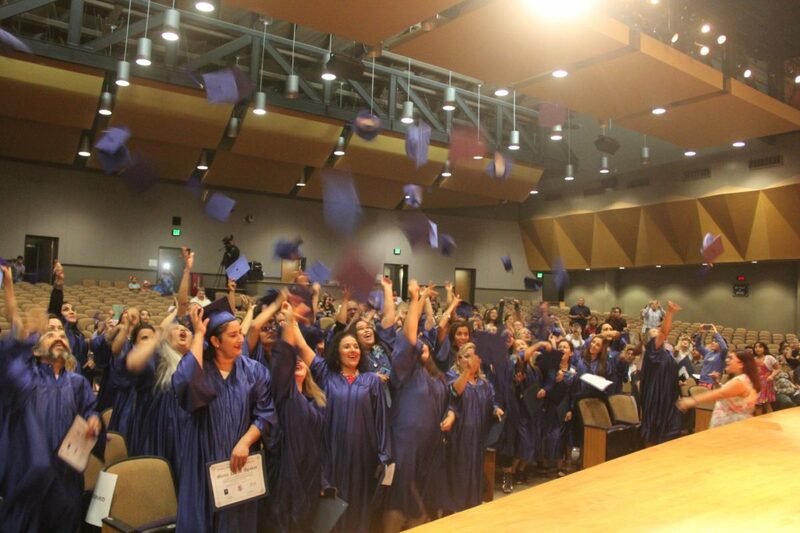 Last week, she walked across the auditorium in her cap and gown for the first time. It was her first graduation ceremony and her children were there to see her graduate and be recognized by the superintendent for all her hard work finishing the program.